Want to experience the hype of the TFV8, but don’t want a 24.5mm tank? Or does a 24.5mm tank not fit on your current mod? Or maybe you just want a smaller version of the incredible original. Well, you’re in luck! We’re excited to announce the brand new Smok TFV8 Baby Beast tank. The micro TFV8 Baby Beast is 22mm version of the original and it holds 3.0ml of e-liquid, so even though this tank is much smaller, it doesn’t lack on the e-liquid capacity. This tank is about 30% smaller than the original, but it still packs a fantastic punch in its small size. The TFV8 Baby Beast comes in at 53mm*22mm and it weighs just 47 grams. This tank is completely detachable and you can remove the base, coil head, glass piece, top cap, and even the drip tip to easily clean or rinse out your tank. Looking for a different coil option or RBA for the Baby Beast? Don’t worry! 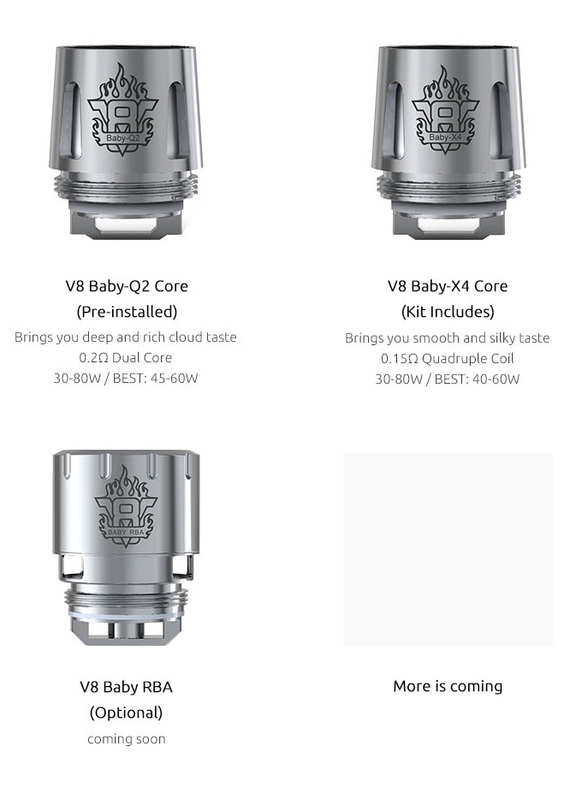 The Baby Beast RDA will be released soon and Smok is going to release numerous different coil options for the TFV8 Baby, as well. The adjustable airflow on this TFV8 Micro is located on the bottom of the tank and it features two large airflow slots. The airflow slots are adjustable, so you have the ability to customize how tight or airy of a draw that you want this tank to produce.